The long-standing perpetual protection for unpublished copyright works that are treasure troves of Australia’s social history is no more. 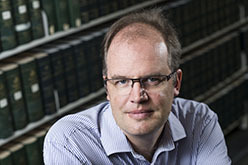 QUT Intellectual Property and Innovation Professor Matthew Rimmer said batches of cakes and bickies, quiet but earnest librarian lobbying, a push from historians and people of letters had resulted in the passage of the Copyright Amendment (Disability Access and Other Measures) Act 2017 (Cth). The new law is also a win for disability organisations in that they are now permitted to reproduce copyright material in a format accessible to people with disability, he said. “The new law has set a finite term life of the author plus 70 years for the copyright on such unpublished items as letters, recipes, photos and diaries that give us an insight into the daily lives of the people who went before us,” Professor Rimmer said. “Previously, because they were unpublished works, copyright in them lasted indefinitely if the owner had not given permission for their publication. “This put historians, librarians, curators and archivists in a difficult position as to how they could use them to research and document our history. Professor Rimmer said librarians, historians, archivists, and curators across the country highlighted this problem two years ago. “They potentially ‘flouted’ the law by organising a national Cooking for Copyright day in which they baked unpublished copyright recipes, and shared them widely,” he said. “The Australian Parliament took notice and amended Australia’s copyright laws to ensure finite terms for unpublished copyright works in Australia. “The legislation also modernizes the cultural preservation exceptions for copyright material in libraries, archives, and other cultural institutions. Professor Rimmer said the new law had addressed copyright issues for people with disabilities. “The Australian Parliament has sought to implement the World Intellectual Property Marrakesh Treaty 2015 which provides a new fair dealing exception for persons with a disability, and others acting on their behalf. “This means there is now a standard set of limitations and exceptions to copyright rules to allow reproduction and distribution of published works in formats accessible to visually impaired people by disability organisations. Professor Rimmer will speak at QUT Library’s celebration of the success of the Cooking for Copyright campaign on July 31 about ongoing issues in Australia’s copyright law. The repeal of anachronistic parallel import restrictions for books could promote access to affordable educational materials – particularly for students. A copyright defence of fair use in Australia could promote creativity, innovation, education, consumer rights, and competition policy. The question of intermediary liability needs to be reconsidered in an age of search engines, big data, cloud computing, and 3D printing. QUT Library Cooking for Copyright celebration will feature a feast of delicious treats made from vintage, unpublished recipes. Register to attend here.